Double Attack Blackjack | Game With Some Refreshing Rules. Double Attack Blackjack is a popular blackjack game variant in many land-based casinos, and has been gaining some traction in the online field at online blackjack Canada as well. There are a reasonable number of blackjack games that have been growing in popularity due simply to a couple of rule tweaks. 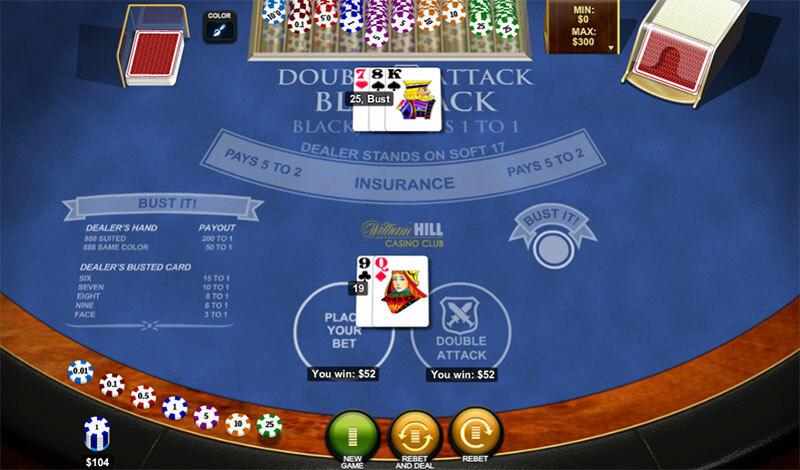 In the case of Double Attack Blackjack, the primary twist to the standard rules is that the player may double their bet after the dealers’ face-up card is dealt, and before any player cards are. The basic rules of Double Attack Blackjack start off with the fact that this game is played with eight 48-card Spanish decks. A Spanish deck consists of the usual 52 cards, with the four tens removed. In Double Attack Blackjack, the dealer stands on soft 17, and will peek for blackjack if his first card is an ace or a ten-card. The game of Double Attack Blackjack starts with the dealers’ face-up card being dealt. Players now have the opportunity to make the game live up to its name and raise their bet. The maximum raise is doubling up on the initial stake. Should, however, the player decide to split later, the Double Attack Bet will need to be matched on the split card. It is with the doubling-up move that players have the advantage, and can double the sum of the original wager and Double Attack bet. The same applies to any surrender taken, and a players’ refund will be half the total bet. One of the most interesting aspects to Double Attack Blackjack, and lending it a fresh zest is the optional BustIt side bet that is offered. The BustIt bet pay table offers some high odds on the dealer going bust. The prerequisite is the dealer going bust with three cards. Players have the opportunity to place a wager on how the dealer will go bust. If, however, the dealer does not bust, this bet loses. Furthermore, players may double after a split, although an aces split may not be re-split. All other pairs may be re-split to 3 or 4 hands, depending on the online casino selected. In discussing the strategy of Double Attack Blackjack, and how to play this variation of blackjack, the statistics are based on re-splitting to four hands. Winning player blackjack in Double Attack Blackjack pays even money, and players are entitled to either double or surrender at any time. Hands may only be doubled once, and any surrender opted for after splitting, will be conducted on a hand-by-hand basis. As is normal in most varieties of blackjack, split aces receive one card only, and insurance pays 5 to 2. In the Bustit side bet that is available in Double Attack Blackjack pay the premium win if the dealers’ three cards are all suited eights. The pay-out on this occurring is 200 to 1. Furthermore, the dealer busting with a 6 pays 15 to 1, and this decreases to a 9, which pays 6 to 1. The dealer busting with a face card pays 3 to 1. The house edge in Double Attack Blackjack is 0.62%. Given the strategy tables that are available for this game, the player will should raise about 60% of the time. The insurance bet has a house edge of 12.27%, and the Bustit side bet 8.01%.